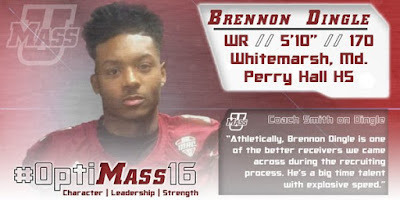 Several recruiting services indicate UMass is interested in Brian Espanet, a 6-4 185 pound WR/DB from Millis HS in Massachusetts. This article mentions UMass recruiting Espanet. Today is Leap Day. As you know, I'm a life-long amateur astronomer. The actual sidereal year is 365.256 days long, so every four years there has to be a year of 366 days or the civil calendar gets out of step with the solar calendar. If a leap year falls on a centurial year and it's not divisible by 4, then that year is a regular year of 365 days (next occurrence is 2,100). Dan Malone has video highlights and and images from Tajae Sharpe's NFL Combine day. Beats watching all seven hours of Saturday's coverage. NESN has a post about Sharpe's fingertip catch. Fantasy Pros reviews Sharpe's performance. NFL Mocks says the Combine was a major success for Sharpe. Giants.com looks at Sharpe as another Jersey guy ready to make his mark in the NFL. Walter Football looks at the WR results and concludes Sharpe is one of the best. CBS Sports has the most-hated college football team for all 50 states. SB Nation has all 129 FBS teams as Pokemon characters. This article from July of 2015 by Sports Illustrated features Coan. 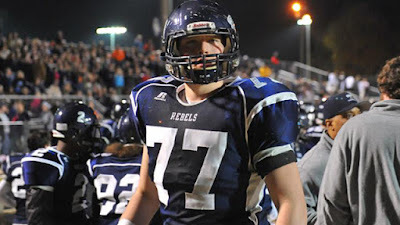 Coan holds over 20 offers including most of the East teams, plus Michigan, Wisconsin and Nebraska. "Largest positive change in five-year rankings: UMass (+11), UNLV (+10), Baylor (+9), Pittsburgh (+9), Texas A&M (+8), Arizona State (+7), Minnesota (+7), FAU (+7), Temple (+6)"
Note this good news depends almost entirely on our 2016 class. If Whipple and staff can deliver another good class for 2017, then there should be authentic light at the end of the tunnel for UMass fans. This link from ESPN looks at some of the New England prospects at the NFL Combine. Tajae Sharpe comes in later in the article. Dan Malone has a post on Sharpe at the Combine. The Cape Cod Times reports Bubba Pena will be inducted into UMass' Hall of Fame. Pena won letters in 1969 and 1970. First team All Yankee Conference in 1970. The WR's TE's and QB's work out in the NFL Combine today starting at 9:00 AM. It's available on the NFL Channel. Check your provider for channel number. The UMass recruiting event was held at the UMass Club in Boston lat night. Dan Malone has a post on Tajae Sharpe at the NFL Combine. CBS DFW has observations about QB's and WR's at the Combine including Tajae Sharpe. Faced with a really dumb statistic, players are trying to make their hands larger. Patriots.com says there are many options at WR (including Sharpe). First Coast News has three players at each position to watch at the NFL Combine, one of them is Tajae Sharpe. BTW, the Combine's website is here. You can watch the QB's, WR's and TE's work out on the NFL Network starting at 9:00 AM on Saturday. Former UMass player and coach Brian Smith will join Don Brown at Michigan and coach defensive backs. SB Nation says the only thing as bad as BC football is BC basketball. Yes, recruiting 2019. 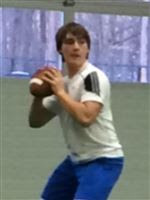 Several recruiting services report UMass is interested in Josh Comune, a 6-1 200 pound pro-style QB from Cheshire Academy. This article says he will have a UMass visit. Drawing interest from BC, Syracuse, Rutgers, North Carolina and West Virginia. 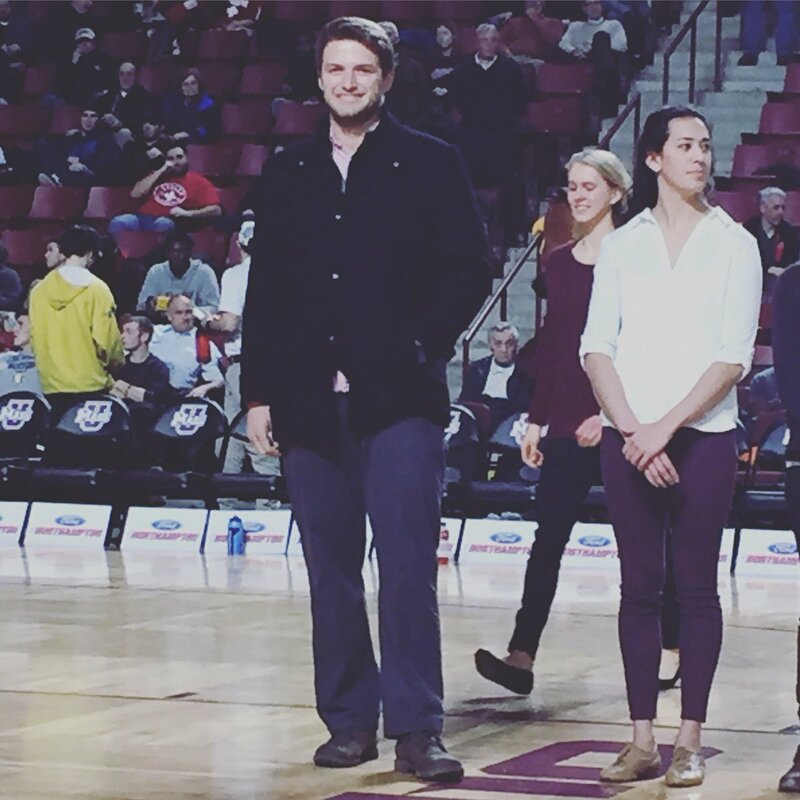 UMass center Matt Sparks had a 4.0 fall semester and is a member of the Chi Alpha Sigma Honor Society. Majoring in engineering. Gillette Stadium announces security changes for 2016. There's a lot of connections for UMass track member Kris Horn. His UMass track bio. Brother of UMass RSRB Kyle Horn. Horn's Hudl.com highlights. Son of former UMass player Kenneth Horn, who won letters in 1978, 1979. Ken was a 6-2 210 pound LB for the Minutemen. SB Nation looks at the worst-recruiting Power Five teams and Boston College trails only Kansas in the list. 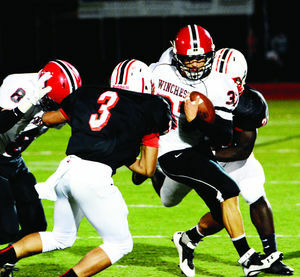 Whipple's pro offense is type NFL scouts favor. 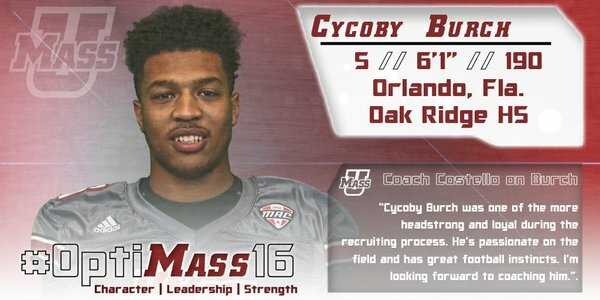 Several recruiting services indicate UMass has offered to Lionel Cummings, a 6-3 200 pound OLB from Bartow, FL. 247 Sports page here. Note this page by 247Sports gives him three stars and ranks Cummings as a top-55 OLB. Besides UMass, Cummings has offers from Colorado State, Florida Atlantic, Kentucky, Southern Illinois and USF. Fire the Musket has a recap of Sunday's Junior Day. Neal Brown and Troy announce their Spring Football Schedule. The Virginia Pilot says Old Dominion's schedule is too tough. They should look at the Minutemen's. SB Nation previews the 2016 Louisiana Tech Bulldogs. South Carolina loses three players: two dismissed and one leaves. The BYU student newspaper looks at the QB battle brewing for the Cougars. Several recruiting services report UMass has offered to Austin Burton, a 6-3 190 pound pro-style QB from Newton South in Massachusetts. This article from September of 2015 features Burton. "Burton has a nice frame and will have no problems packing on weight to his 6-3 frame. He's a mobile quarterback who can run for positive yards but has all the attributes you want to see in a pure pocket passer as well. He has a strong enough arm, throws with accuracy and has nice touch on his deep ball." 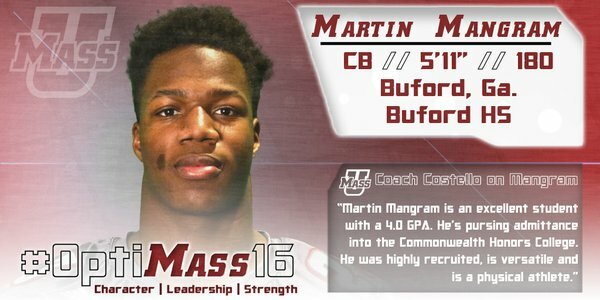 UMass is currently Burton's only offer. Drawing interest from BC, Duke, Northwestern, USC and Wisconsin. The latest iteration of the 2016 roster has some changes. Troy, coached by former UMass player and coach Neal Brown announces their 2016 home schedule, which includes UMass. Like UMass, the Trojans signed a highly rated recruiting class. 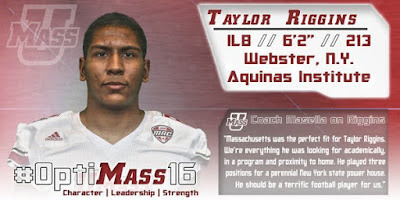 UMass recruit Tyler Thompson was involved in a wrestling tourney controversy. Speaking of wrestling, UMass recruit T.J. Rayam won his third straight state title. Counting UMass, 22 FBS schools have position coaches openings. Boston College announces a $200 million upgrade to its athletics facilities including an indoor football practice facility. Several recruiting services indicate UMass has offered to DeMarco Artis, a 6-4 220 pound OLB from Seminole, FL. Earlier had decommitted from Kentucky. "This was the perfect setting and environment for former Kentucky commit and Sanford (Fla.) Seminole pass rusher, Demarco Artis, who used his speed and quickness against heavy-footed offensive linemen all afternoon. Artis flashes impressive explosion and burst at the snap of the ball, and shows good use of hands when making initial contact with his opponent as well. " Besides UMass, Artis has offers from North Carolina, North Carolina State, Louisville, Kentucky, Iowa State, Florida Atlantic, Virginia Tech and UCF. UMass Football's Jake Largay and Micah Morel help out at the Leaman Legacy Day Clinic here and here. Dan Malone has a story about the clinic and a photo gallery. Fire the Musket has a post about yesterday's Football Junior Day. Most of the players were from New England. A Fan Sided writer says the Patriots should consider Tajae Sharpe. NFL Spin Zone says Victor Cruz's contract is an issue. The Florida Gators go into Spring ball with a quarterback battle. Boston College's Spring game will be April 16th. Phil Steele has the complete returning starters list for 2016. Hawaii, Old Dominion, Tulane, Boston College and BYU are all in the top-25. UMass is 123rd. 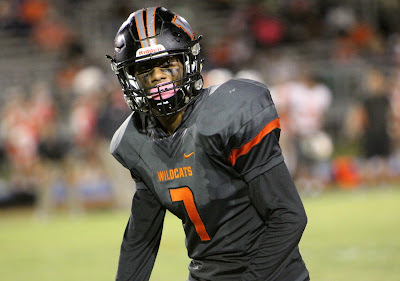 Several recruiting services indicate UMass has offered to Jordan Pouncey, a 6-3, 186 pound athlete from Winter Park. FL. This article from yesterday's Orlando Sentinel features Pouncey (mentions UMass). Besides UMass, Pouncey has offers from Charlotte, Colorado State, Iowa State, Louisville, Wake Forest and West Virginia. UMass Insider has a post about FRRS WR Jon Derolus. The Pittsburg Steelers release Rob Blanchflower. Today's U previews Florida International's 2016 schedule and says they'll be challenged early. BYU has a punter from New Zealand. The NCAA is working to update college football safety guidelines. Several recruiting services indicate UMass has offered to O.J. Tucker, a 6-1 190 pound DB from Ocala, FL. 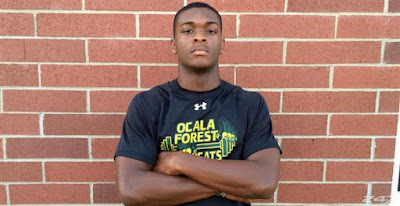 "There's one defensive standout out of Marion County who's currently making a splash and rising up recruiting boards at a rapid rate. O.J. 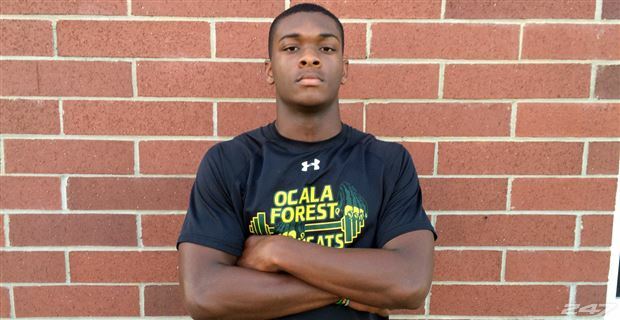 Tucker, a 6-foot, 190-pound junior cornerback out of Ocala (Fla.) Forest who's piled up close to a dozen offers over the past month, made the headlines once again on Tuesday evening when Dan Mullen and Mississippi State delivered him SEC offer No. 1." 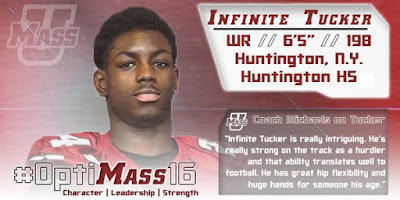 Besides UMass, Tucker has offers from Nebraska, Mississippi State and a couple of MAC teams. UMass OL coach Shane Waldron has taken a job with the Washington Redskins. Scout.com's Packers Report has a post on the WR's invited to the NFL Combine including Tajae Sharpe. You're probably up on how Louisiana's budget crisis may affect the state's college football. 2016 opponent Louisianna Tech has a three-star WR decommit because of it. South Carolina coach Will Muscamp buys a $1.85 million house. I've guessing that's probably bigger than Coach Whipple's. 2016 foe BYU has a quarterback controversy brewing. Several recruiting services report UMass is showing interest in Damarri Mathis, a 5-11 175 pound DB from Lakeland HS in Florida. 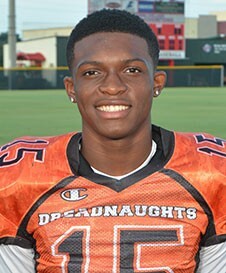 "FAU has also offered Mathis, who said he knew about Southern Miss but not much about the football program. "I really want to take a visit, but I'm really not sure if I'll be able to work that out in the spring," he added. Mathis said he's also hearing from Bowling Green, U-Mass, and Iowa State. " 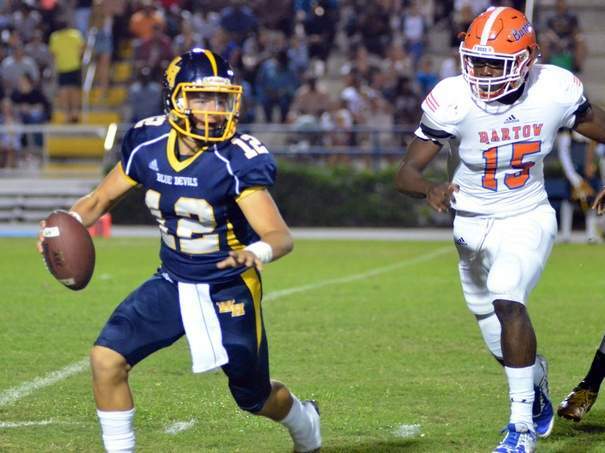 Mathis holds offers from FAU and Southern Mississippi. A Atlanta Falcons bloggers looks at Tajae Sharpe. A Cleveland Browns writer considers Sharpe. A Bleacher Report writer wonders if the Giants should cut Victor Cruz. The Florida Gators open Spring Practice March 9th. SB Nation says opportunity awaits the FIU Panthers in 2016. Athlon Sports grades Tulane's hiring of Willie Fritz as an "A+". SB Nation previews Old Dominion for 2016. 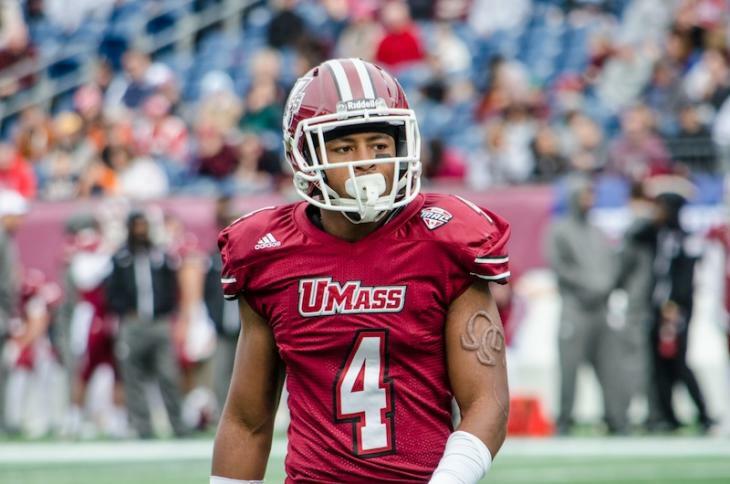 Three UMass football players were arrested for a "noise ordinance" violation over the weekend. When the cops come and say "turn it down" because the neighbors are complaining, you've got turn it down or the next time they visit someone is going to get arrested. Fantasy Pros reviews Tajae Sharpe. A Cowboys mock draft has Sharpe to the NY Giants in round 6. A Giants blogger thinks Victor Cruz will return to New York. 2016 opponent BYU retains its fifth-year senior QB. Hawaii will open its season against Cal in Australia. The Hawaii team does the traditional Polynesian "haka" war challenge before the game. The power of the Haka. The New Zealand All-Blacks do it best. 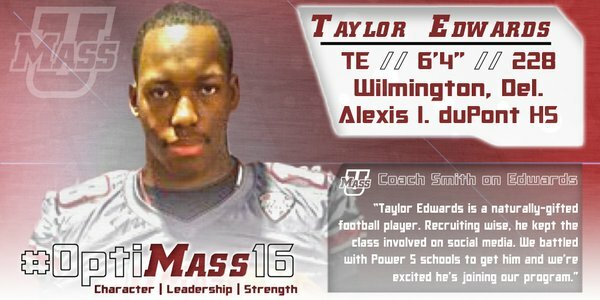 Could UMass be adding another player to it's 2016 recruiting class? 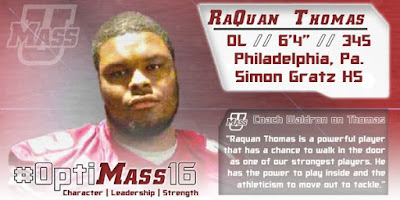 NJ.com says UMass is waiting for SAT scores on Devon Robinson, a 6-6 300 pound OL from Windslow Township in NJ. Originally committed to Illinois, but re-opened his recruiting. 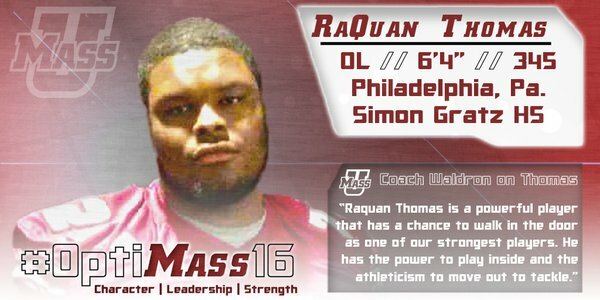 Larnel Coleman, a 6-7 OL/DL from Malden, MA was one of 30 recruits listed in UMass' 2016 signing class. 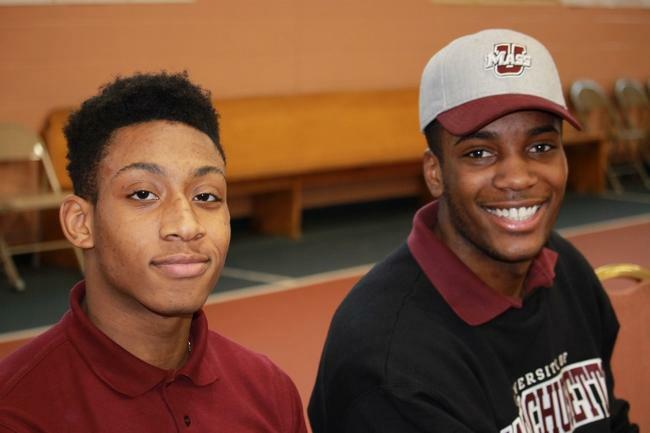 This article from yesterday's Wicked Local North features Coleman's signing with the Minutemen. Note also he was on the school's Honor Roll. 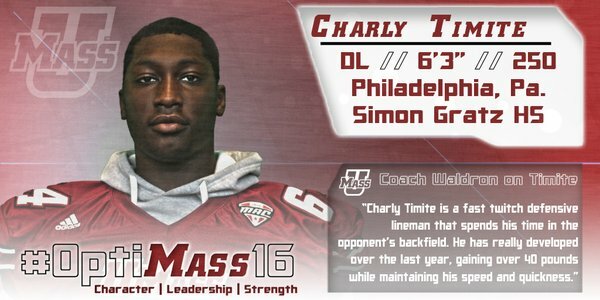 UMass adds James Carson to the Football strength and conditioning staff. In studio announcers may be here to stay. 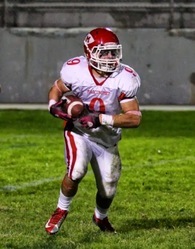 A blog reader who keeps an eye on the SEC sent me this link about Isaac Nuata, a five star TE who will play at Georgia. He's originally from Buford HS (the Alma Mater of Brandon Mangram and 2016 recruit Martin Mangram). Nuata also played at IMG Academy I blogged about yesterday. Buford HS is a talent pipeline UMass will want to visit again in the future. 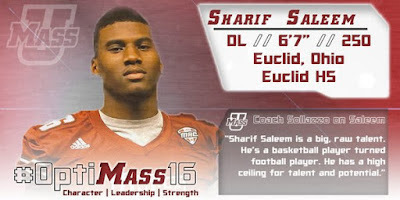 Good work by the UMass coaching staff to establish a recruiting beachhead there. Victor Cruz defends Cam Newton. 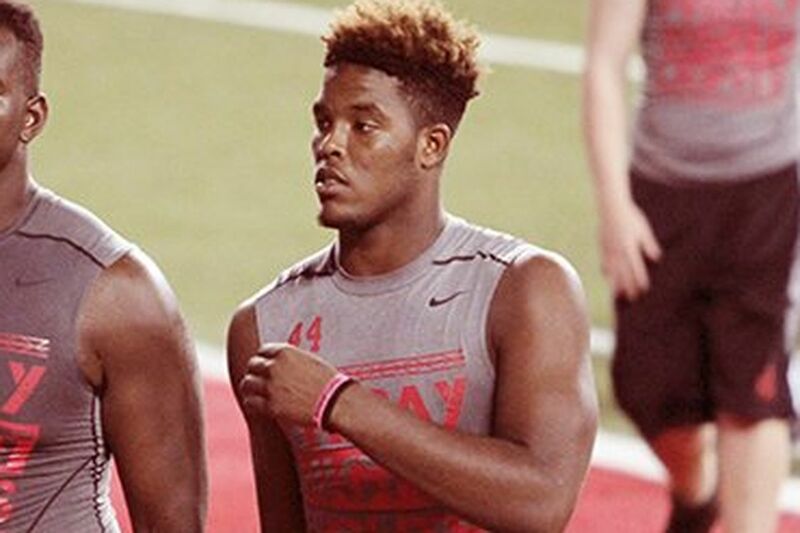 247 Sports looks at possible team leaders for the Florida Gators in 2016. 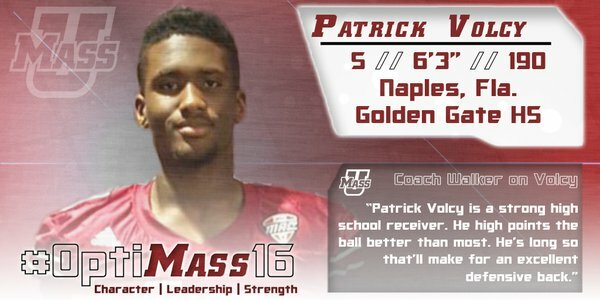 Several recruiting services indicate UMass has offered to Tobias Larry, a 6-2 190 pound OLB from Lakeland, FL. Besides UMass, Larry has offers from Bowling Green and Southern Mississippi. RedskinsDC.com has a long draft preview of Tajae Sharpe. UMass recruit T.J. Rayam, has earned top seed in Alabama's HS wrestling tournament. UAB football is looking for future opponents, could UMass be part of the picture? Boston College looks to improve its offensive line performance in 2016. Old Dominion adds former UMass assistant coach Chris Malone (2001-03) to their coaching staff. IMG Academy is becoming a one-stop recruiting mecca unlike any other. Gerhig Dieter, who had 8 catches for 85 yards against UMass on October 10th, is leaving Bowling Green to play his final year at Alabama. Dan Malone has a post about Tajae Sharpe being invited to the NFL Combine. Tajae makes the top-100 prospects. Florida, UMass' opener in 2016, just landed the #1 JUCO RB in the nation. Eight Gators were invited to the NFL combine. Mississippi State goes into Spring football loaded at the linebacker postion. Three weekday games mark Tulane's 2016 schedule. ODU envisions a facility that seats 28,000-30,000, constructed to easily expand if desired. North Texas, among the Monarchs' Conference USA rivals, and Tulane of the American Athletic Conference recently built stadiums of that size for approximately $80 million. College football will likely instate an NFL-style replay system. The Vineyard Gazette has a long post on Randall Jette's preparation for the NFL Draft. Good to see Jette will get his degree as he works on his football skills. Bob McGovern will no longer publish the Maroon Musket. We'll miss Bob's invaluable recruiting scoops. An SEC site ranks the league's OOC schedule, which include three teams that play UMass. Speaking of the SEC, this post has five keys for the South Carolina 2016 season. The same site also does five keys for the Gators season. SB Nation has a complete list of players (including Tajae Sharpe) invited to the NFL Combine. Hustle Belt has a story about Sharpe and Roger Lewis being invited to the Combine. 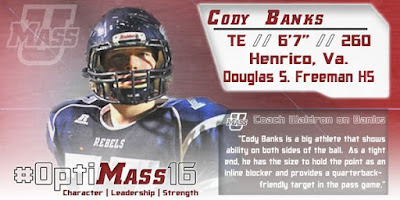 I didn't do a post on kicker Randy Alay signing with UMass on LOI Day. I've blogged about the 6-0 220 kicker before. 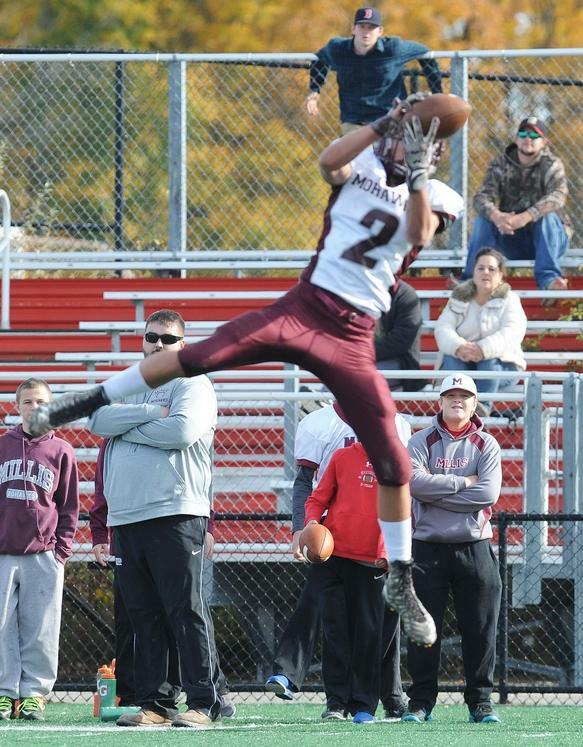 Yesterday, Wicker Local Waltham had a story about Alay's signing with the Minutemen. Since my August blog post about him, Hudl.com has added senior highlights. 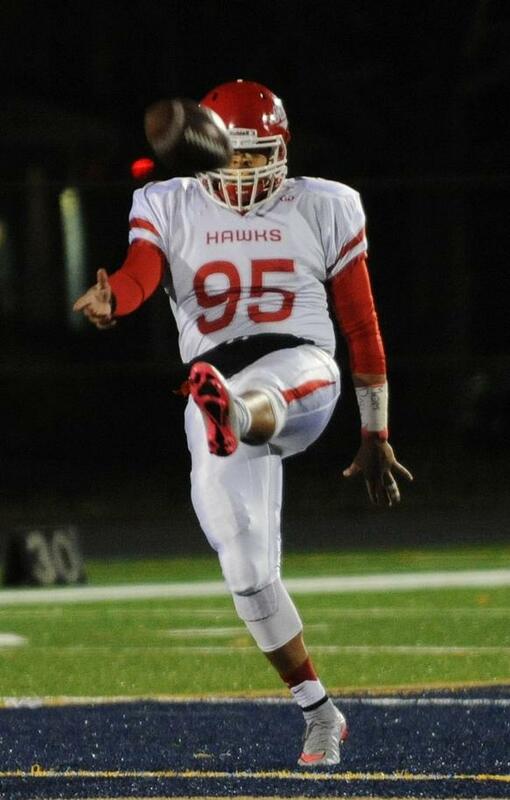 Alay had three field goals and two punts of 66 and 55 yards in his school's homecoming game. I purchased the 1978 UMass Football press guide off E-Bay. It's in good shape after 38 years. The 1978 squad took UMass to the first FCS National Championship game. 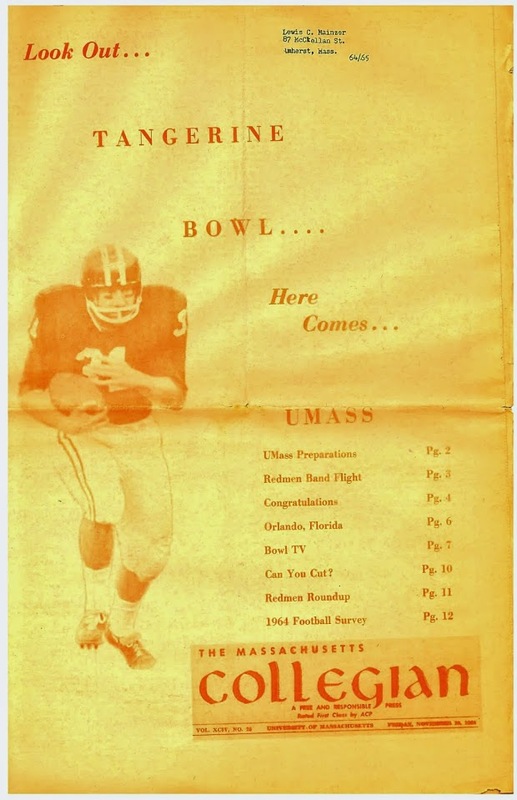 I've added five or so scans of the contents to the UMass Historical Scans section of the Blog. It's a great addition to my collection of UMass press guides and game programs. The '78 press guide has bios of the coaches and players. I've included the "preview" section. Checkout the 230 pound offensive linemen who took us to the National Championship game. ESPN ranks Boston College's OOC schedule as the 2nd easiest in the nation for 2016 with a "built in win" against UMass and UConn. Speaking of BC, the Eagles should have a new QB and a new offensive scheme for 2016. A NY Giants blog thinks Victor Cruz will return to NY. Victor talks rehab and about the new Giants HC. ESPN looks at Vladimir Ducasse's chances to remain with the Bears. Several recruiting services indicate UMass has offered to Ramon Patton, a 6-1 210 pound Safety from Jones County Junior College. Behind Wilson will be Pascagoula freshman Ramon Patton (6-0, 215). "Ramon was with us in the spring," Bilderback said. "He has really improved so much since January. He will factor in a lot either as 'Bobcat' or free safety. With his development, all Ramon needs is experience. He is very good against the run and fast enough to be good against the pass as well. "In terms of ball skills, he is probably the best secondary guy we have." Had 48 tackles in six games for the Bobcats. Mark Whipple, the architect of one of the University of Massachusetts football program's most successful eras, is entering his third year of his second stint leading the UMass football program. He was previously at the helm of the Minuteman program from 1998-2003 when he led the Minutemen to the NCAA I-AA National Championship in his first season while making two additional postseason appearances in the following five years. 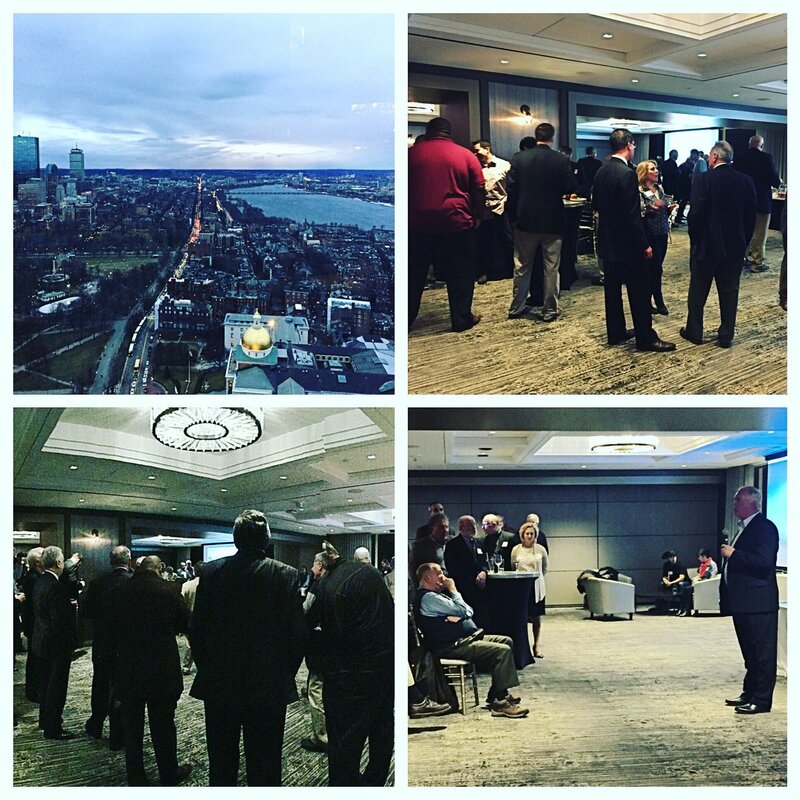 Attend to meet Coach Whipple while also supporting the UMass football Gridiron Club. Any donations received will serve as a charitable contribution towards the program. Seating limited, RSVP required. Please RSVP by February 22, 2016. Questions? Contact the Minutemen Club at minutemenclub@admin.umass.edu. So far this year, BC football and men's Hoops are 0-19 in the ACC. FIU has its signing conference and releases the Panthers 2016 schedule. Mentions UMass. Campus Insiders has five keys to Old Dominion's 2016 schedule. SB Nation looks at BYU's 2016 schedule. This article from the Detroit Free-Press features Hudson. 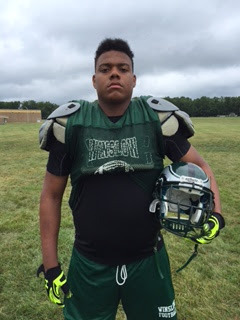 He holds offers from a number of MAC schools including Eastern and Western Michigan. The Worcester Telegram profiles former UMass star Phil Vandersea. Fan Sided covers Tajae Sharpe for the NFL Draft. Victor Cruz leads potential NY Giants cap cut players. Underdog Dynasty reviews Tulane's 3-9 season. 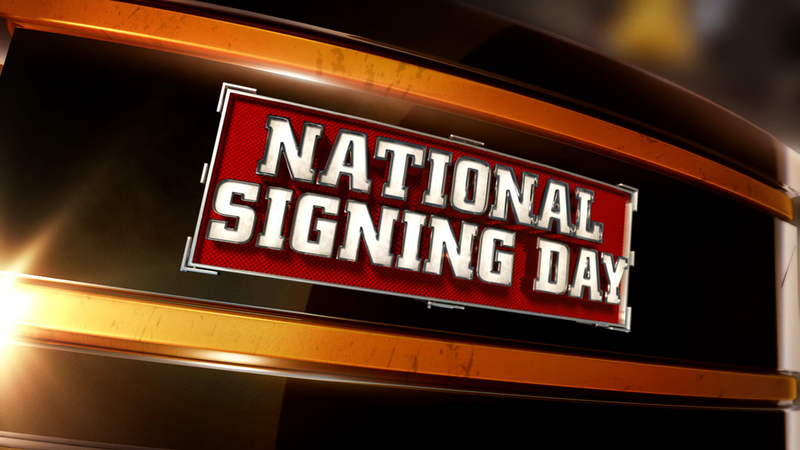 ESPN reviews BC football post signing day. Neal Brown's Troy football made some improvements in 2015. 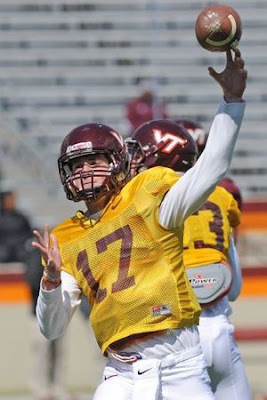 2016 FCS foe Wagner adds a QB transfer from Syracuse. The latest version of the UMass roster lists Davis Clarke as a RSFR DB. UMass has season tickets on sale and renewals are on route. Four games in Gillette: Boston College, Mississippi State, Tulane and Louisiana Tech. Whipple said they tried to get Tulane to Amherst, but they said no. Visiting teams want to play in the pro venue. The two Amherst games, FIU and Wagner are early in the schedule, so the weather should be good. 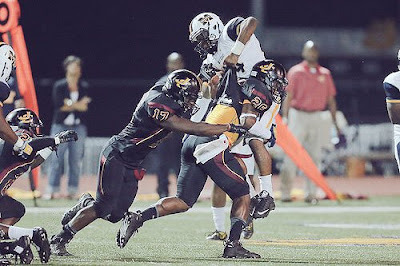 A TCU blog thinks former UMass commit Artayvious Lynn could be a "sleeper" recruit. Former UMass player and coach Ben Albert joins the Duke staff. Campus Insiders thinks UMass is a winnable road game for the Louisiana Tech Bulldogs. The Washington Post says Redskins need a big WR and Tajae Sharpe is one they could think of. Victor Cruz says he'd rework his contract to stay with the Giants. 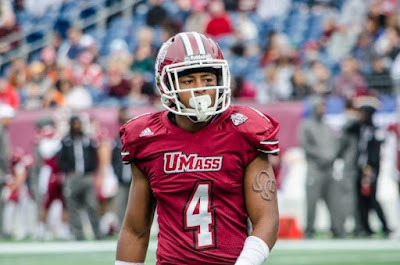 The latest version of the UMass roster has Gavin Monagle, as a RSFR defensive back. Monagle is a 6-0 185 pound DB from Topsfield, MA. NCSA Recruiting has his profile. This article from 2014 features Monagle. SB Nation looks at returning experience and production for 2016 and finds UMass dead last in college football. Cycoby Burch makes one writer's best names team. ODU announces its 2016 and the article reminds Minutemen fans of a painful episode. Victor Cruz discusses his future with the Giants. UMass ended up with 247Sports #78 ranking in college football recruiting. That's three notches behind Boston College. Thought experiment. Here's BC's recruits. Would you take the Minutemen's or BC's? BC ended up last in the ACC (by a fairly large margin). Speaking of the Eagles, Paul Pasqualoni (former Syracuse and UConn HC) joins the Boston College staff. UConn ended up last in AAC (but it was close). College football considers expanding replay's for the targeting rule. Dan Malone talks about UMass' recruiting success as an independent. The Boston Herald takes note. Western Michigan again led the MAC in recruiting. You remember the Broncos went 1-11 in 2013. Since then Western Michigan has gone 16-10 and went to two bowls. Their recruiting has made a dramatic change in their record. Delaware Online has video, an interview and comments from the coach on Taylor Edwards signing with UMass. Good stuff. NorthJersey.com has a post on Leyshawn Askew signing with the Minutemen. Campus Insiders has a post on who won the recruiting battle for every state. Louisiana Tech announces their 2016 schedule. BC Interruption says the Eagles recruiting is a house of cards. Highlights from yesterday's signing day. 1. Whipple said he expects the 2017 class to be even better. 2. Whipple and several of the assistant coaches inferred that recruits were more excited about playing nationally known teams than going to DeKalb or Akron. 3. The UMass staff received positive feedback from other college staffs about the recruiting process in Amherst. 4. I like the number of defensive recruits. 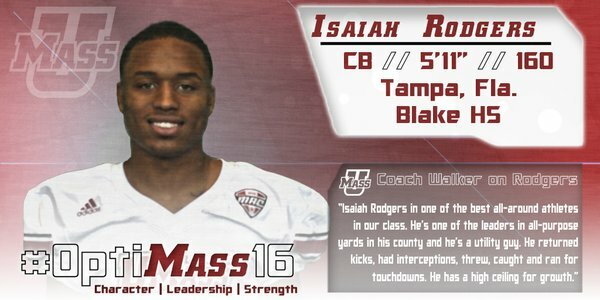 In our first four years, UMass wanted to jump-start the offense. Usually the numbers would be like 13 offensive recruits and 8 defense. 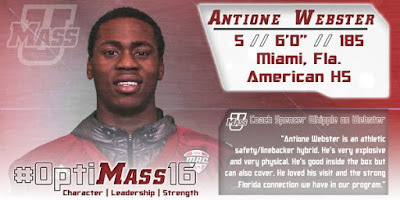 This year, with the big class, UMass signed 16 defensive players and five of them will be on campus for Spring ball. So far, we have not been winning shootouts. Last year in our three wins, the defense gave up 14, 17 and 26 points. In four losses, the defense also played well enough to win. I think the improved depth and more size and talent will pay big dividends in the future (just don't expect UMass to beat all those SEC teams). 5. 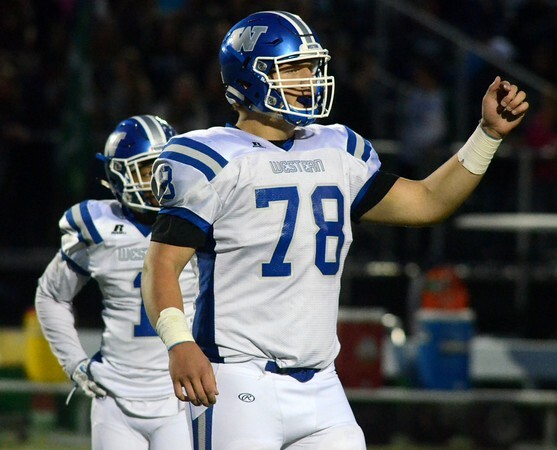 Whipple said UMass will be adding four or more "preferred walk-ons" in a couple of weeks. A number of Massachusetts players will be in that group. Dan Malone says Infinite Tucker makes the LOI Day all-name team. Andrew Ford. With the possible exception of Jeff Krohn, who was starting quarterback for a PAC10 team, Ford is the highest rated QB ever to sign with the Minutemen. Matty Vautour breaks down the 2016 recruiting class. Matty says social media was a big part of the Minutmen's recruiting success. Bob McGovern has takeaways from UMass' recruiting class. Delaware Online has a story about Taylor Edwards signing with UMass. 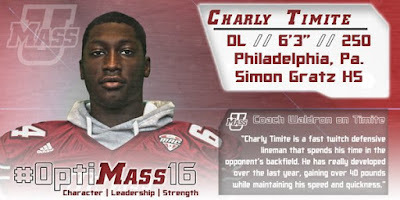 Philly.com has a post about Charly Timite and Raquan Thomas signing with the Minutemen. App.com has a story about Tyler Thompson signing with UMass. Euclid HS, Sharif Saleem's old school had a big signing day yesterday. Martin Mangram's school, Buford High did well also. The Miami Herald has a post about Antoine Webster signing with the Minutemen. UPDATE: I'm pretty tired after two trips down to UMass in less than 24 hours. So far, not too much available we didn't already know. Dan Malone has 17 three-star recruits sign with UMass. Looking at 247Sports UMass recruiting page, it looks like the Minutemen signed all their verbals except for Zuriel Davis. That might be a paperwork thing. It appears nobody flipped at the last minute. That's good news. Michael Traini's last ever post at Hustle Belt is a recruiting recap of today's signings. There will be lots more media coverage tomorrow. I'll have some images and start to talk about how we did and how UMass did it. Bob McGovern says Mark Whipple hit his stride with this recruiting class. 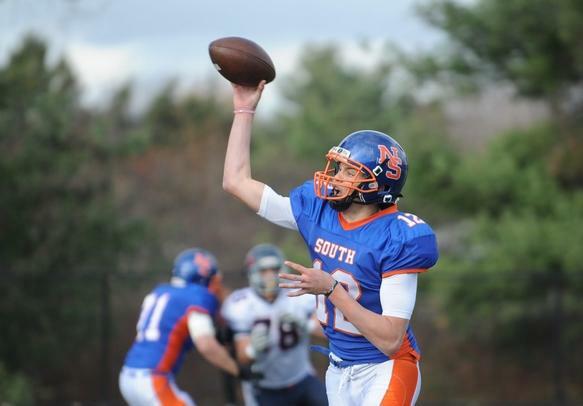 Dan Malone has a post on JUCO QB Andrew Ford verbaling to UMass. Dan will post today's updates. 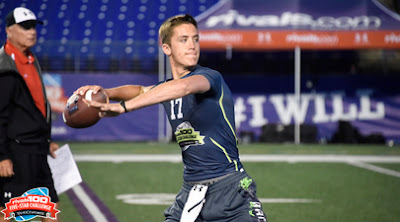 Michael Traini has a post on UMass' recruiting at Hustle Belt. As of 7:30 AM, the Minutemen are one ranked #75 nationally, one step behind Boston College. If we were in the Sun Belt, we'd have the top class. We'd be in the top half of the AAC. We'd be #2 in the MAC. Mark Whipple announces the first official signing of the day. From August of 2014: Tucker poised for a big year. OK, got to shut down now to get ready to drive down to Amherst for the luncheon. More updates this afternoon. I'll be going to the LOI luncheon later today. Hope to have some news and images post. The National Football Post reports Randall Jette makes his bid for the NFL. The Portland Press-Herald reports on Liam Coen's being named offensive coordinator for Maine. GoBlackBears.com has a post on Liam's hiring. The Miami Herald says out-of-state teams are harvesting Florida's talent. Sports NOLA has funny tales from LOI Day. Athletic Business says teams toe a thin line with negative recruiting. 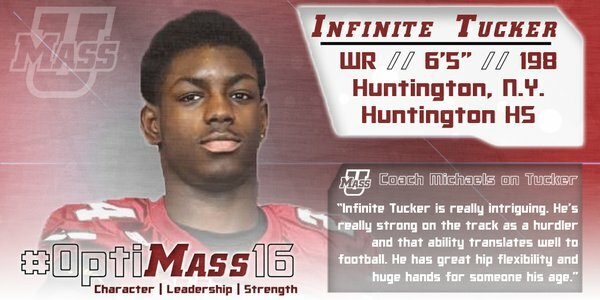 UMass continued on a truly amazin' recruiting roll as two three-star recruits verbaled to the Minutemen yesterday. Andrew Ford, a three-star JUCO QB has verbaled to UMass. Bob McGovern has the story. 247Sports page here. I've blogged about Ford before. Originally signed with Virginia Tech. 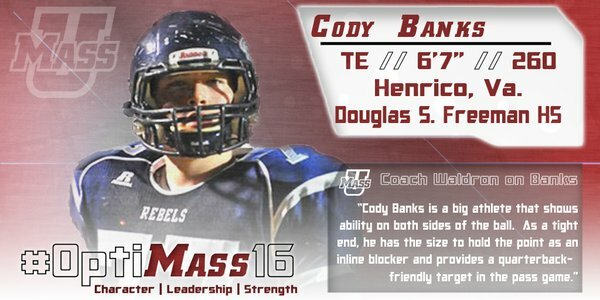 McGovern reports in another post, Cody Banks, a 6-7 250 pound TE from Richmond, VA has also verbaled to UMass. With yesterday's verbals, 247 Sports ranks UMass as #78 in the nation ahead of a number of Power Five schools. The Minutemen are #2 in the MAC recruiting rankings and tied with Western Michigan in three-star recruits. ESPN has twelve reasons why college football is better than the NFL. College football coaches wonder why there is no early recruiting signing period. AP looks at previous #1 college football recruits and finds a mixed bag. Bob McGovern says positive momentum for UMass football recruiting continues. 247 Sports has UMass ranked #85 nationally after getting a verbal from three-star recruit Bilal Ally. 247 Sports ranks the Minutemen #2 in the MAC recruiting ratings. Boston College is ranked last in the ACC. UConn is rated next to last in AAC. Catching up on non-recruiting news. UMass adds former UMass players Matt Dawson and Scott Woodward to the staff. UMass post on Dawson's appointment here. Matty Vautour has a story about the new coaches and coaching position changes here. Dan Malone has a longer report on the additions. NBC Sports has a story about coaching additions at UMass and Hawaii. The latest iteration of the Spring football roster has the new coaches plus the early enrolled players. Former UMass player and coach Clarence Brooks has been battling esophageal cancer. The Detroit Free Press has a story on why colleges and recruits play musical chairs. For the nth time, there is going to be a new start-up spring pro football league.